Closer Than Ever opened at International City Theatre on February 12. After wooing audiences for almost a month, the show will close this Sunday. We were lucky enough to meet with veteran actor and cast member Kevin Bailey to ask him some questions about the show and theatre as a w hole. Please enjoy! 1. As someone who has worked at ICT before, how has your experience been this time? This is my third show for ICT. If ICT were a restaurant, I’d give my experience a Michelin Three Star Award! I have had another exceptional theatre experience worthy of a special journey. As had my past experiences at ICT, this journey started with the very best of professionals from all creative departments: an outstanding Director (Todd Nielsen) and Musical Director (Gerry Sternbach), a dream cast to perform with, and the ICT production staff to brilliantly put it together. By its very nature, creating theater magic requires many chefs in the kitchen working together to make the fare superior to watch and enjoy. caryn desai is the master chef who gives the rest of us the room to do (what I hope) is our very best work! 2. What do you hope audiences take from Closer Than Ever? Closer Than Ever is a tricky little musical — very easy to underestimate the way it unfolds. I would like audiences to see themselves in at least one, and ideally many, of the relationships displayed in each of the songs, as each one is a story unto itself. If someone is able to identify with a specific character or a theme, then they will be moved to smile, laugh and even shed a tear. The music and lyrics are simply that powerful. 3. Which song is your favorite to perform and why? Okay , I hope you’ll allow me two — I know that’s cheating. Of course, getting to perform the anthem, “If I Sing,” is without compare. It brings up every single feeling I have about my own dad and the unwavering support he has been to me every day of my life. 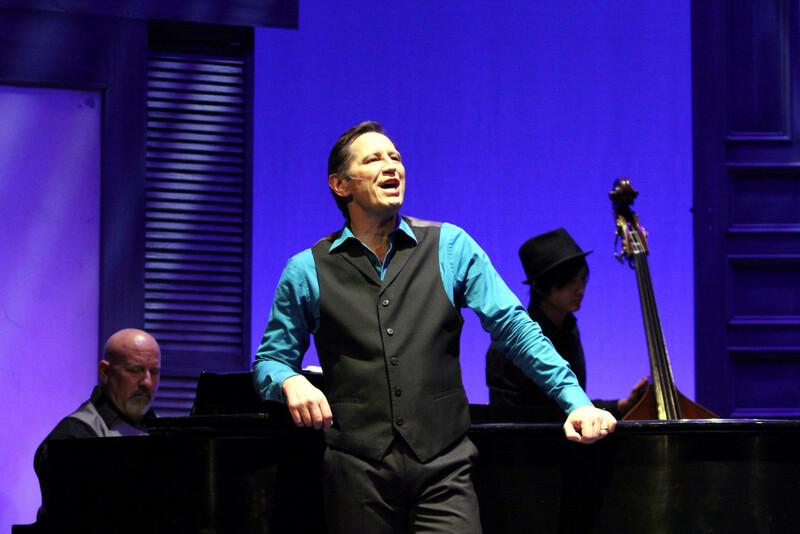 But, I also get this humorous and contemplative song about a relationship that has lost its spark titled, “There.” It’s a great song to act each night and I get to perform it with a theater giant, Valerie Perri. That’s what we refer to as Heaven on stage!! 4. You have had an impressive career in musical theatre. What do you love about this art form? Only in theater do you get to know immediately that you have made a difference to your audience and “moved them” in some way. They may laugh, they may cry , they may simply smile; but something is happening in the moment and in the next moment and those moments impact all the moments after that. It is never the same from one night to the next, at least not entirely. Similar, yes, but it’s the difference that is exciting and working to have an impact each night is the gift of theater to me. 5. If your life was a musical, what would it be called? If I could make up my own title it would be, “Blessed.” Otherwise, I hope you will allow me the answer, “Lucky Guy.” Those titles best represent how I feel about my journey. Closer Than Ever runs through March 6. For more information or to purchase tickets: please visit www.ictlongbeach.org or call 562.436.4610. This entry was posted on Friday, March 4th, 2016 at 2:54 pm	and is filed under Uncategorized. You can follow any responses to this entry through the RSS 2.0 feed. You can leave a response, or trackback from your own site.